Seeking for stable predictable cash flows is the principle investment objective. In this strategy, HC focuses on high quality assets that produce stable income. Usually, such assets are complex structures, or tend to be neglected due to market size or capacity issues despite possibly being a part of broadly well known indices. Our definition of “Income” strategy is a portfolio of which average coupon revenue represents 80% or more of expected return. We value coupon because the coupon payment on face value of a debt or a bond remains the same regardless of market valuation. In addition, markets may be illiquid. Consequently, HC uses yield to maturity for expected return to avoid over expectations. We focus on managers who are diligent in analyzing and predicting debt service coverage ratio and free cash flows of the borrowers. Are there debt/bond investment opportunities in Japan? Maybe not. Bank loan market is not open to investors and is very difficult to access. 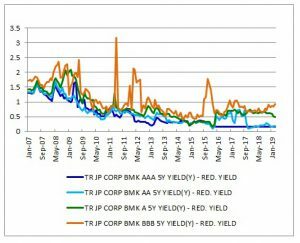 Japanese corporate bond yield is typically lower than interest rate on loans as most major bank clients are not rated nor listed. However, due to tighter financial regulations, we see growing opportunities in these fields. Those are seen mainly in real estate related and small-mid sized corporation debt sectors. Non-Japanese banks and investment banks are selling Japanese assets at a discount, and domestic banks have had difficulty adding exposure Debt/bonds traded at a discount, stressed or distressed strategies are incorporated under “Evolving investment opportunities” tab. 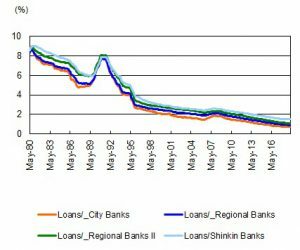 These are unique opportunities born from tighter bank capital regulations, especially after the Lehman crisis. The same tab would also include new alternative finance such as asset finance and infrastructure (please see “Evolving investment opportunities” tab ). *refer to “Market size of Japan as of Apr 2019” on the right side. *refer to “Average Interest Rates on loans(source: BOJ, as of Jan-19)” on the right side. *refer to “Corporate Bond yields by credit ratings(source: Datastream, as of Feb-28)” on the right side. The bond market is small compared to the JGB market but sizable enough to involve major players, primarily financial institutions and passive investors. Additionally, investment opportunities can be found especially in lower investment grades and higher non-investment grades.